Although most insist that thoroughbreds want to run, love to run and were, in fact, born to run, often these same guys and gals cling to other beliefs that contradict such a notion. Huh? I thought horses loved to run. Why do they have to be urged or whipped to strut their best stuff? As proof, let's take a peek at the record books. For, if one accepts the notion that horses need to be goaded by human beings, i.e. jockeys, to put their best foot forward, it stands to reason that most world record times would be recorded by horses that were put to a drive in the stretch. Easy winners (as indicated by a large margin of victory) would be an exception to the norm, it would seem. It is also a misconception that easy winners make for good bets in their next start. As Dr. William Quirin documented in “Winning at the Races: Computer Discoveries in Thoroughbred Handicapping” (first published in 1979), horses that captured their previous outing by three lengths or more do, in fact, win more than their fair share of races, but they do so at greatly deflated odds. My own studies confirm Dr. Quirin’s findings. And if you are searching for an automatic handicapping toss-out, look no further than the easy winner that is switching surfaces (turf to dirt or dirt to turf). I found 170 such instances in my database of over 6,000 races and the results were abysmal: just 14 winners (8.2 percent) and a return on investment (ROI) of -60.85 percent. 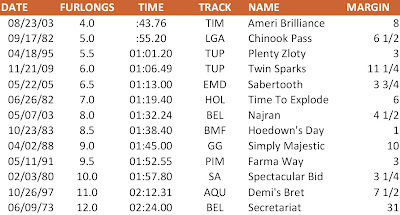 * Horses that won their most recent race by three lengths or more over today’s general track surface (dirt/turf). * Horses that won their most recent race by three lengths or more over a different general track surface (dirt/turf) than today’s. 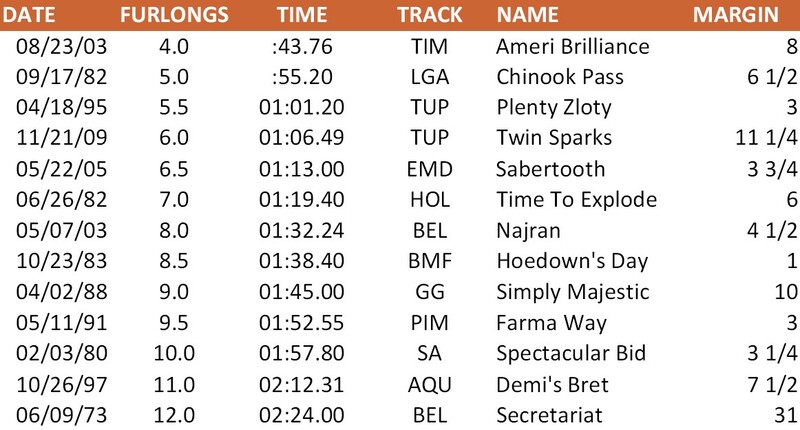 Does your theory factor in winners who benefited from torrid early fractions and passed the front-runners easily? I'm coming at this from a harness racing perspective, though. Our records get set when two horses duel for a half-mile and a horse comes from off the pace and blows by them. They also look like they are not being urged while winning by open lengths. No, T.J., but you make a very good point, even in thoroughbred racing. That's why these big winners are often overbet too. In fact, I'll try to do a study looking at big winners vs. the par time of the race in question (whether they met the par or not) soon.